We rode for eight hours or so. Five of those hours were trying to leave Bangkok. I was chief navigator, which is probably the main reason. A few people have subtly suggested I couldn't find my way out of a sack. But honestly, it really didn't help that motorbikes aren't allowed on any of the highways, and the only roads straight out of Bangkok are highways. Bikes have to meander down little zigzag roads to go the same route, and there's billions of the buggers. We bought 3 maps. We could see the roads on the maps, we just couldn't see them in real life. A huge number of people tried to help us. Once when we stopped, one man drew us his own map and explained it fully (in thai), while another girl phoned a friend so she could explain in English where to go. Everyone was amazingly patient, except for us. Personally I was chewing my own face off with frustration. The roads were huge, and there were police everywhere. Anyway, amazingly, somehow we made it out, and rode for a pleasant few hours through fields and little towns, past a million 7-Elevens selling packeted seaweed, and nice wooden stilt houses. For lunch we stopped at a roadside shack. An old gentleman with few teeth but a very smiley face chatted to us for a bit and told us he was paying for our drinks. But it was all a big lie- he had secretly paid for everything, before zooming off in his truck, and we didn't find out until we tried to pay. We rocked up to Chai Bhagan, a little town kind of in the middle of not-very-much, and were chuffed to find a hotel at all, let alone one with a swimming pool and AC for 9 quid. The day seemed charmed. There was a little rustic-looking open air restaurant, like a beach bar. But it had a brand new shiny white Harley parked under a spotlight in the middle, and biker-gang photos all over the walls. 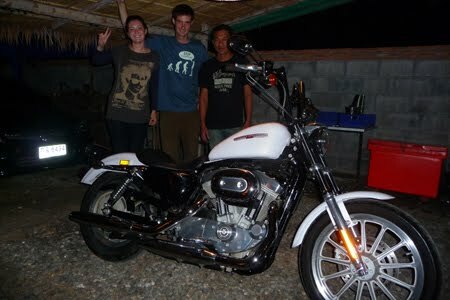 We'd found a Thai biker-bar by accident! 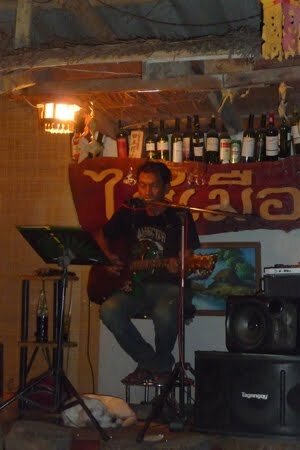 He wandered off to suddenly play excellent acoustic thai music live onstage, with a guitar and harmonica. We even got that John Denver song dedicated to us and our adventures, and he rocked away with his hound curled up by his feet. He was very, very cool. 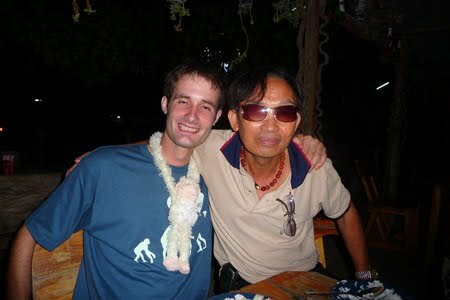 His friend appeared and fed us more beer, then the table opposite bought us a monkey. It was all getting amazingly surreal. 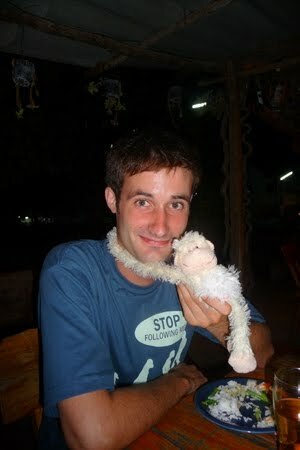 By the end of the night we were very drunk, and very happy, and Adam wandered home with a monkey round his neck. Thailand was proving damn fine. When we were looking for information for shipping bikes it was very hard to come by for this route, so we decided to put this on for anyone looking to do a similar thing. 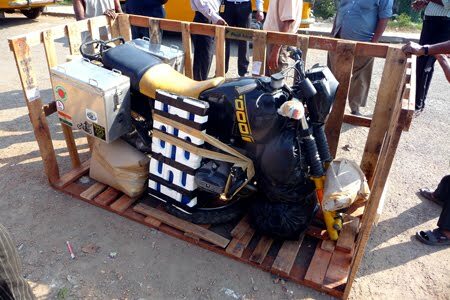 So here’s a shipping report for anyone trying to ship bikes from India to Thailand. Obviously we didn't actually want to ship at all, and would much prefer to do it all overland, but Burma aren't willing to give motorcycle tourists visas, so that was that. 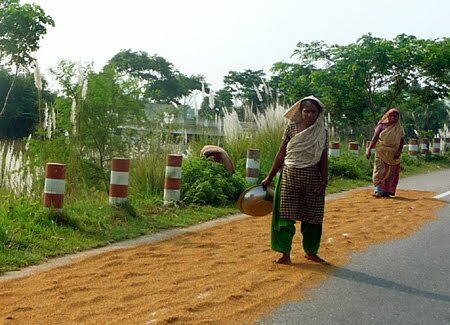 We went as far as we could, right up to the border in Bangladesh (we even asked the border guys), but then turned back and sent it from Calcutta. We researched various departure points and destinations around the area and this one won in terms of price AND speed. 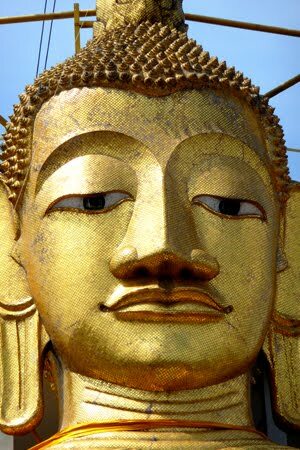 Kathmandu to Bangkok was pricier on flights for us, and based on other peoples reports pricier for shipping too. 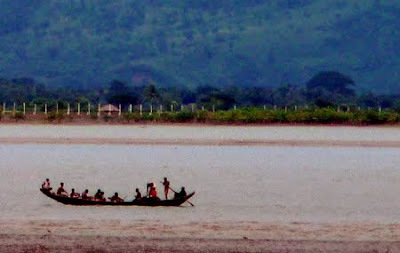 Chittagong in Bangladesh for sea shipping proved to be far more expensive, far less professional, and much much slower. Chennai, Sth India, to Bangkok looked to be about the same price for shipping, maybe a little more on the flight. 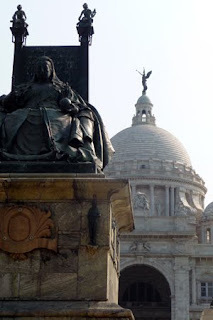 We were right up north though and when the trip was factored in it made more sense to go to Calcutta. Tower A, 11th Floor, DLF IT Park, 8 Major Arterial Rd, New Town, Rajarhat, Kolkata. We used a guy called Swapan Dutta, but he wasn’t around much as I’ll explain later. We went on a Monday, but as it is India, they were closed for a holiday (National Brother Day...). Returned on Tuesday, and arranged quite efficiently to do the whole thing the next day including bike flight! This was all that held the bike up the whole way..... it did work though and got there fine. Pleased, we returned on Wednesday for an arranged appointment. Then we were left sat in reception for 2 hours without anyone speaking to us... The crating process was started, though without our knowledge. We met them a while later and helped crate it. We had to change the dimensions they had decided to make the box to, which they did fine. The crate company were very good and efficient. 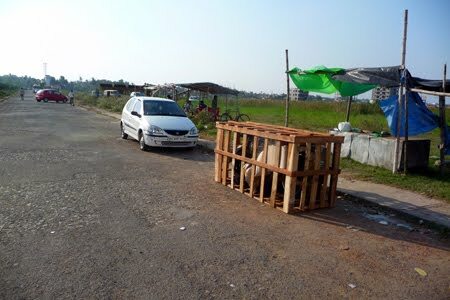 The crate was quite rubbish, but just standard for India I think. Possibly if you are very precious about your bike you may want to make your own, which would probably be fine with DHL. Our bike was not tied down with any straps, and we didnt have any. It had small wedges of wood around the front forks and rear tyre keeping it stood up. It all looked a little dodgy but it did make it there fine. We took the front wheel off, and windshield to save space. It was a bit smaller, but if we had been there for the whole crating process it could easily have been a bit smaller still. 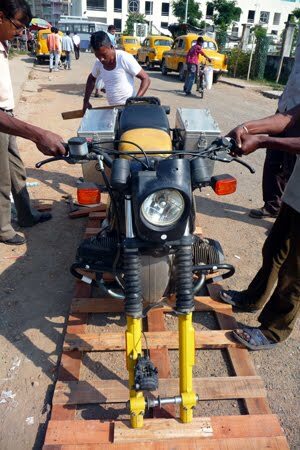 The bike got crated at the side of a road, when finished it was lifted onto the back of a van by several flip-flop wearing men. 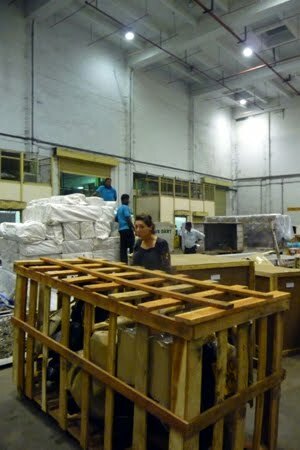 A few hours later crating was done, and Mr Dutta promised to get the paperwork sorted for us that evening, though it was too late to ship that day. Thursday we went back for our meeting at 9.30, and were kept in reception again for 3 hours without any sign of Mr Dutta. When we eventually asked what was happening, we were told Mr Dutta was not actually in the office that day. Another guy told us he would get onto it and do the paperwork (that Mr Dutta hadn't done the night before like he said he would). He told us to go for a walk for a while, and he would call us in an hour. A couple of hours later we called him, and were told nothing would be done that day and to come back Friday. 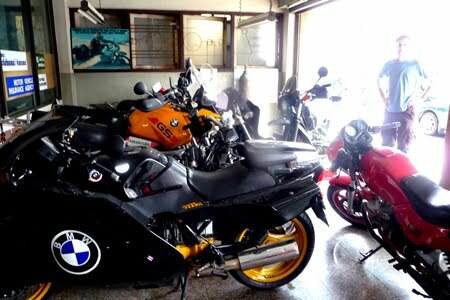 On Friday we went back, waited another couple of hours, finally collected all forms, and went to the airport to meet the DHL agent there for bike inspection. The DHL agent met us two hours late and immediately went on lunch. There was a theme developing... Eventually after waiting another few hours, we met with customs, who tried to extort a bribe (to not open the crate back up to check for drugs) and failed, and then also did not open the crate, thanks to realising we weren't good for any money. He did the paperwork pretty quickly after this, and the bike flew on the saturday night. Overall they did get everything done and it did come in at a good price, but don't believe it when they tell you it wont take long. They seem to like to keep you waiting without telling you what is going on . We worked out we spent over 20 hours waiting for someone to do something that week. Our flights we arranged on Saturday, and flew the next morning. They were with Air India, through a travel agent. That bit was easy. Got to the International Cargo Complex at the new airport in Bangkok at about 10am. Once there and with a security badge (available from the office right at the gate), you have to take the shuttle bus to the Thai Airways Cargo depot down the bottom. 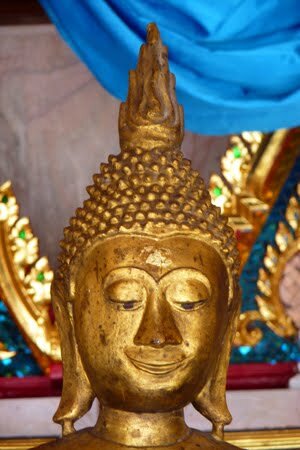 Once there, ask for the storage fee payment office, and pay the storage fee, which for us for one day was 600Baht. Then take the receipt and get bus back to near the gates. Go to the customs office, and go upstairs to the 1st floor. Walk around the glass screen into the actual office area, and randomly approach someone. They will point you to the right man, who will do somehting to your forms. We just gave him all of ours, and he did something. Whatever it was, it cost 30 Baht. 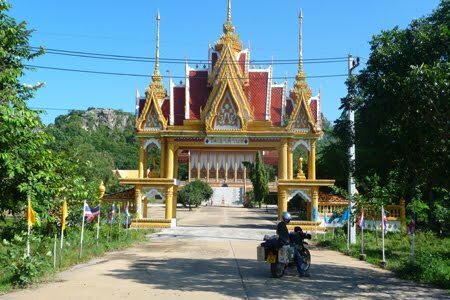 Then go back downstairs and hand in all your forms plus two photocopies of carnet (if you have a carnet, if not, just the reg docs, just for details of the bike), two copies of main page of passport, and two of the visa entry to Bangkok, and your passport. This all goes to the person in charge of a Temporary Import of Personal Vehicle. In our case she was very nice and smiley. She will take about forty minutes to do something else to the forms, and will bring you a form to sign which holds you liable for a whole load of money should the bike not leave the country within a certain amount of time (Thailand don't use the Carnet system so this is only way to do it). 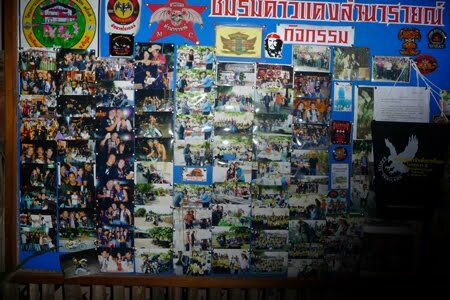 Getting it back in Thailand was fairly easy. Customs staff were friendly and helpful. Then take all your finished forms, get back on the shuttle bus to the cargo area, where you'll find your bike. The cargo guys will uncrate it all (free of charge), and you will get to put it back together again. They then sign one piece of the white slip you now have, and you then get the other bit stamped by the inspector on the way out. Our bike didn't actually seem to get inspected at all. We also didnt get the other bit stamped, he just waved us through. This may or may not cause enormous troubles on the way out of Thailand. Check for updates! Then you are off, but do not go on the motorway on the way into Bangkok as you will be fined $25 by the very present police. Bikes not allowed. 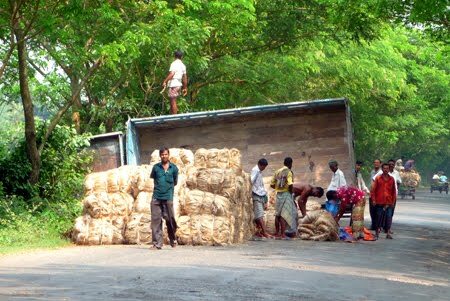 The freight bill total with all docs and all money at Indian customs came to: 310GBP or 24,000IRP or $490 (USD) depending how you like your money. The breakdown on the actual bill wasn’t very specific, but the total price was fair, and he put us on the next weight tariff up, meaning we saved money. We didn’t ask for this, he offered. We made it!! This is just a mini-update but we are now in Bangkok, and the bike is sat happily in the courtyard, pleased to no longer be caged. 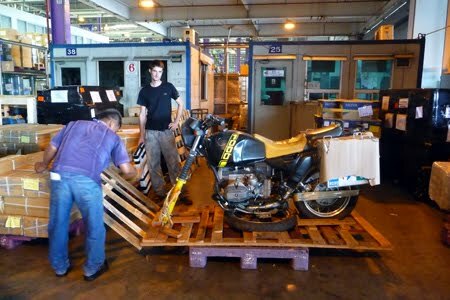 Customs was a blimmin nightmare, and took a day of faffing, and then we couldn't put the bike back together again for quite some time. But in the end all was well, and after 6 hours or so we brought Manfred home, on beautiful tarmac roads, with a real road system. before we spent a very long time trying to wedge the disc brake back inbetween the seized brake pads, and then rode off without a front brake. 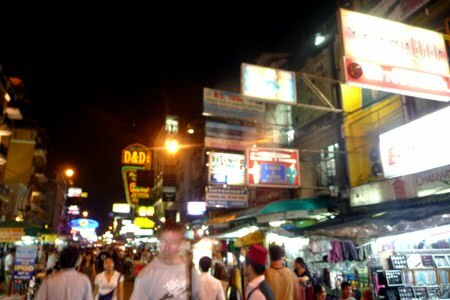 The streets were packed with shopping centres and trendy thai teenagers in mini-skirts. It was a far cry from our last few conservative countries. I reeled in shock, and therefore a stiff drink was quickly required. The bars were full. 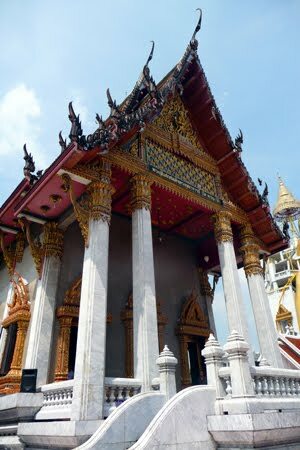 We sat inebriated in a bar where tight-skirted ladyboys flirted with tourists. The pavement had a shack with crusties dancing to loud trance on the road, so we joined in after some legendary Thai Red Bull and bounced. 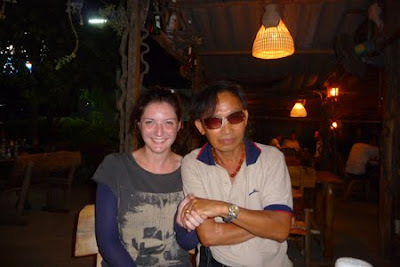 We met an old crusty, allegedly a Navajo tribesman, who jerked to the music while he told us he used to be a gangster in Bombay for thirty years, but he got fed up with people stitching him up, and came to Thailand to set up trance parties. We took our poor battered steed to a fantastic bike-vet (Dynamik Motors, searchable on Google), who gave it a new back tyre for a fair price, and tuned the engine and balanced the wheels. He was great, and just what it needed. Now it is purring at us. Another culture shock at the bike doctor. Bikes bigger than ours? Surely not. 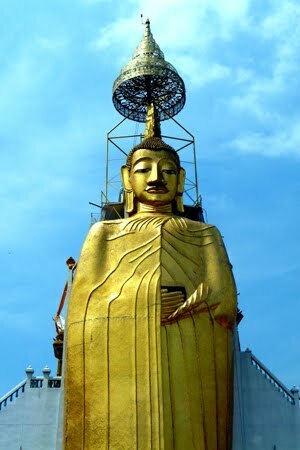 On the way home we found a very big golden Buddha and went to say hello. 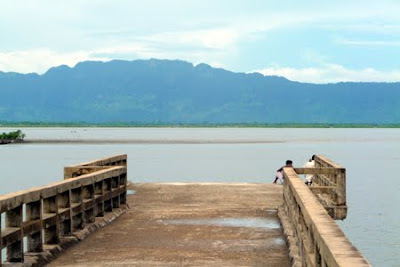 Tomorrow we leave for Laos! The roads are said to be 'great for off-roading'- read atrocious. Its going to be a mission. We will reach there in a couple of days- we are heading up north to do a loop south again. Will report back properly in a few days! Last thing at night in Dhaka on our way back to the hotel, I jumped in a skip. The passers-by openly guffawed. A scruffy Foreigner had just launched herself into a bin at dusk to emerge grinning with a giant piece of polystyrene. A security guard saw a commotion, and marched over to tell the bloody insolent beggar off… until he saw the bloody insolent beggar was a white tourist in a bin. Then he looked a little perplexed, and snuck off. But we had a giant custom painting on a bit of tin, and it needed protection. And there weren‘t all that many DIY shops around. And anyway, the polystyrene seemed to work alright. We fashioned a beautiful if somewhat improvised security blanket for it back at the hotel. I wish I had a photo though. 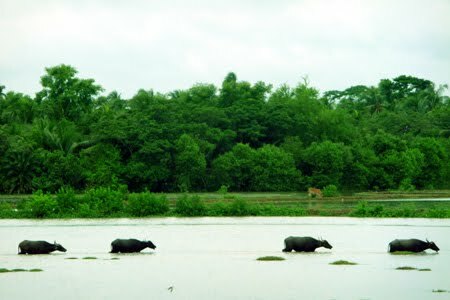 The next day saw us embark upon a very long, hard day from Dhaka to Calcutta. It also included a scary border crossing with our slightly forged visas. We left at 5am to beat the horrendous Dhaka roads into submission. i want one. its perfect. a new and improved hay-stacking method, and lots of grain. There was a horrible ferry ride we didn’t even know about. The ferry was a deck full of cars and us in the hot sun. We were a very tired captive audience. Everyone got out of their cars to stand within a meter of us and stare for two hours. Then the buses saw us, and emptied. People followed us around the deck as we hid in the shade under the cars. But even when we made eye contact and smiled no one spoke to us. 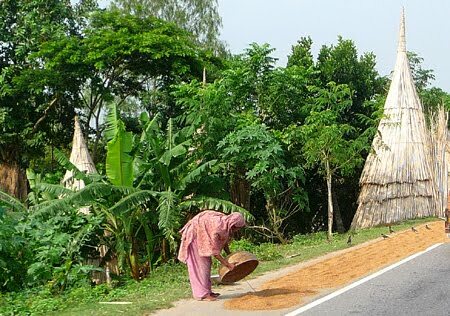 We bounced through a nice bit of rural Bangladesh with people threshing grain out with their feet, drying it on the road, and trying out various new and interesting ways to stack hay. The Indian customs on the other side didn’t want to let us in. They peered at our forged visa stuff and my palms grew a little sweaty. They tried to make us unpack. This hasn‘t happened to us yet, and luckily we managed to persuade them it was entirely unnecessary. They sent us this way and that, forwards and backwards, and then tried us for ‘baksheesh’ (tips). 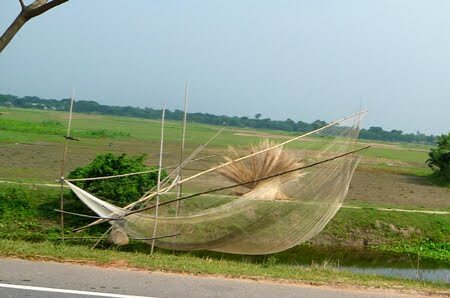 a big old fishing net. these are everywhere. 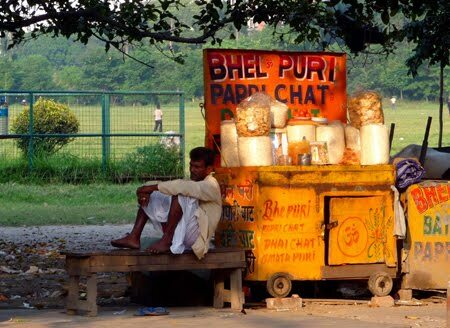 Eventually we were through, and without a backward glance we raced straight to a chai stand. A wonderful old lady with a big grin and two teeth cooked us a big dinner with tea for 60p, and asked me why I wasn’t wearing my nose ring and bangles. She patted my head. We were out of Bangladesh. 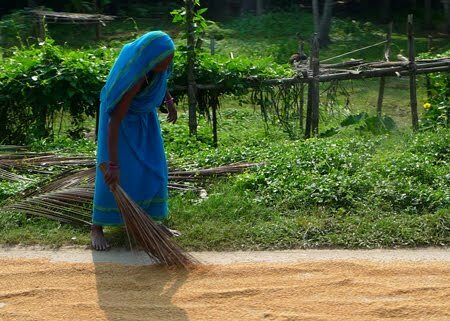 In rural West Bengal I saw dung patties flung at the giant trees lining the road, drying in the sun with little handprints in them. They looked pretty, considering someone had been rolling their hands around in cowdung to make them. 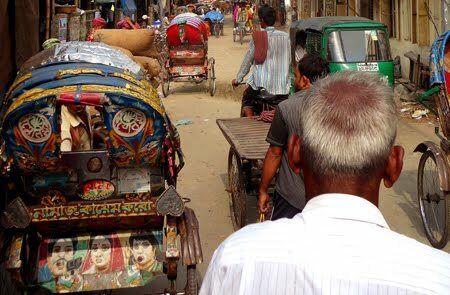 Big groups of women in the villages rode flat rickshaw trucks to visit relatives, all dressed in their saris, giggling on the back. 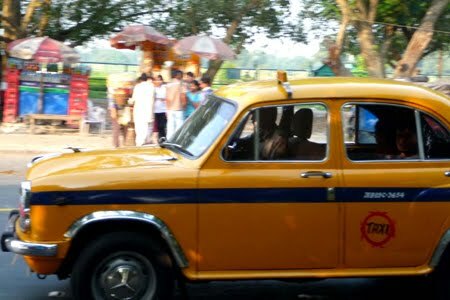 We rode the long way into Calcutta as it got dark-it seemed a crazy city- rich and flashy with giant ‘townships’ of newly built flats with manicured gardens and big gates. Huge modern shops lit up with neon glow. 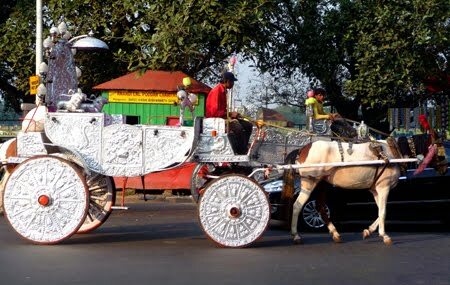 There were gigantic road systems, with real traffic police, and super-markets. There was a tram system. I saw Metro stations. Without knowing it we had arrived on Diwali. Everywhere had giant strings of neon lights hung up, there were temporary temples erected out of silk, with bright panel light pictures flashing on and off. There were tunnels of light erected, and all the telegraph poles had striplights attached to them. The world was very bright. Everyone seemed excited and buzzing in their finery. New saris crackled. There were red and green fireworks going off above the city and firecrackers so loud it felt like the inside of my head was exploding. We had made it. Tired and filthy, we asked at every junction for directions. In the centre of Chowringhee there were hordes of foreigners- backpackers in their scraggy groups. 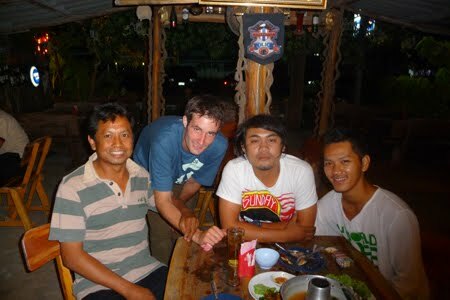 We experienced severe culture shock that night, after over a month of really hardly seeing any other foreigners. For three weeks there we were the only tourist-weirdos around. 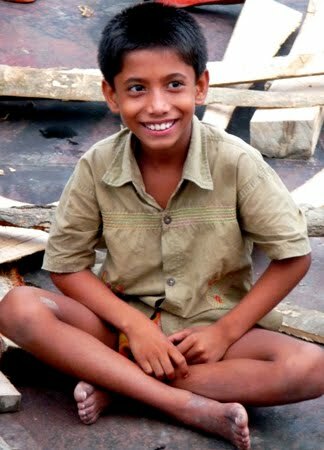 We sat huddled in the corner, gawping at tanned backpacker kids with their skirts in rags. We watched with cynical eyes as travellers had uplifting, life-enhancing experiences sat chatting with the beggars on Suddur Street. We are here to ship the bike by plane to Thailand. Calcutta must wait. But inbetween the shipping stuff still happens. Last night we saw a poor little mad guy screech and claw at the air. Then he threw himself into the gutter. Everyone stood and stared at him, and a procession went past, nearly squashing him. We met a Norman, an Anglosaxon who likes to chat to Brits because his great grandfather was one. He held Adam hostage for an hour with the bike. We also met an Ynes, a highly irritating but very friendly ‘market guide’ who appears whenever we turn a corner, to then proceed to walk in front of us, thereby ‘guiding’ us to places we were going to anyway, in the hope of money. We watched the Kali Diwali procession get the effigy stuck in a tree. It was enormous. The road was narrow. The trees were large. In most places you’d think someone might have thought of the problem beforehand really. But this is India, so the drummers and dancers carried on without a care in the world while the organisers extracted the branch from Kali’s ear. We smiled at the fattest, healthiest looking women beggars ever seen, wearing nice saris, sat around the tourist district smiling and chatting, and watched them switch on saddened faces suddenly to the passing foreigners. We walked around trying to get cash from the ATMs and failing. There were streets and streets of night-markets, with every conceivable item, mostly really upmarket stuff, all next to giant chain stores selling suits, and a Rolex branch. 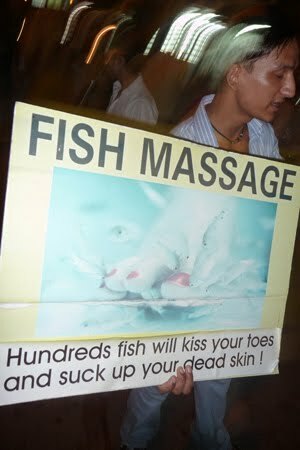 Never believe another Lonely Planet writer telling you Calcutta is squalid. what a job. Calcutta are actually making these illegal this year. The shipping has taken us a week. It was supposed to take 2 days. Today is the first day we have had to do anything fun, and we have a flight booked for Thailand tomorrow. 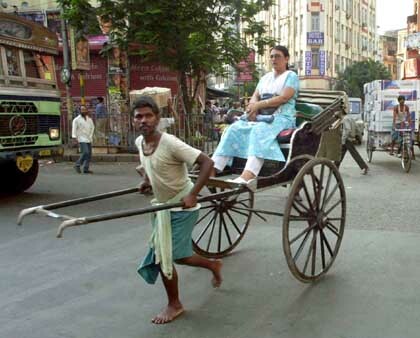 Calcutta will have to remain a touristic mystery. Anyway, then we found the memorial. It was packed full of big families. It was impressively large. It featured a lovely statue of Queen Victoria, resplendent in her girth. Inside we wandered round an exhibition on the British rule in India. One exhibit was a replica town street from the 1700s. It looked like someone had just cut a window to outside- there was no apparent difference at all. The only difference between India in 1700 and India now is the lack of hoighty English prigs in breeches, waddling around with 110 servants to dress them. We meandered around the exhibition, and wandered home via a very good restaurant where the waiters wore bandannas and sneered a lot. 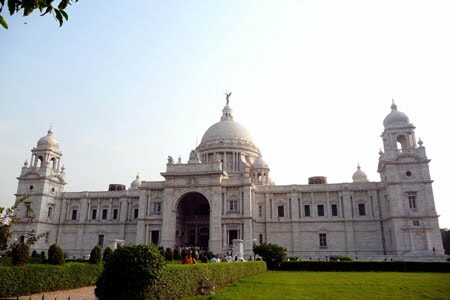 That’s it, we have run out of time in Calcutta and seen, well, not a lot. But we have shipped the bike, hopefully. Its not been all that easy. But it was a lot cheaper than sending it by sea in Bangladesh. We shall see what happens in Bangkok. For any motorcycle-people out there looking for shipping information, I’ll do a whole post on it once we get the bike back from customs that end. That way it will have everything in one place. At customs: me. looking distinctly fed up. and poor Manfred, suffering. ...and what the hell is in here? It is a 'US Department of State Diplomatic Pouch'. 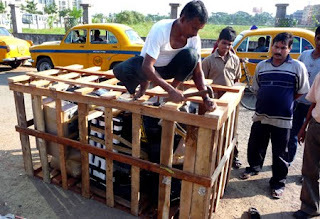 We found it lying around in Calcutta customs. Possibly the US has taken to shrinking its diplomats. 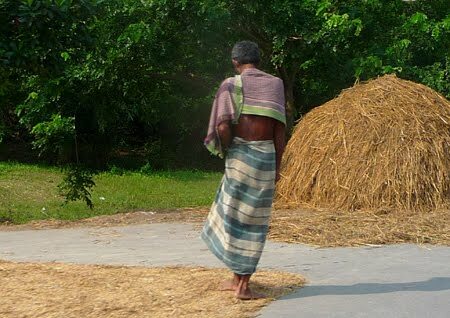 A strange old time in Bangladesh. 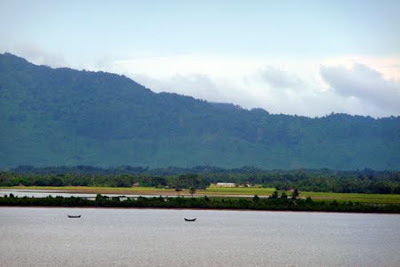 In Chittagong we sat in the hotel room. 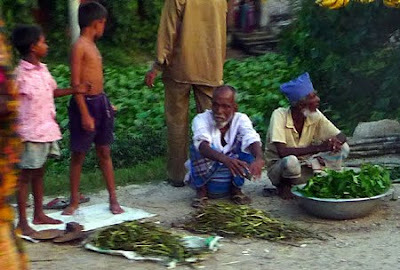 Through the window we could see beggars sorting through piles of rotting vegetables. Their little kids sniffed varnish out of bags and stumbled up and down the road. The bike sat in the underground ‘carpark‘. A group of labourers slept down there, on a tarpaulin in the dark. They took it in turns to manually pump sewage from the hotel foundations. They sang in canon while they worked, like the old African slave songs, and waved at us with big smiles. 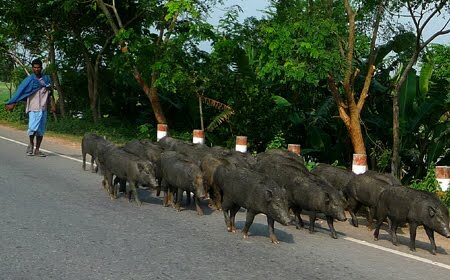 Sometimes it seems like everyone is trying to leave Bangladesh. In the internet cafes, people fill in the ‘Online Diversity US Visa Application‘. Yesterday a man showed us the way to a restaurant. He handed us a CV, and asked us to give it to someone in Britain. It wasn’t his- he couldn’t speak any English. He had printed someone else’s CVs off, and carried them with him in case an opportunity presented itself. We tried to explain that we were frankly the least likely candidates for employee referral, but language barriers prevented any real communication. So if anyone out there needs a slightly fake computer engineer, who is very certainly also a dab hand at Bangladeshi eatery navigation, please get in touch. 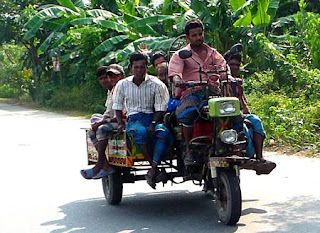 It is pretty tough being a tourist in Bangladesh. Everyone immediately tries to place us in a relevant social context, because we are so unbelievably alien. No one can tell what social strata we are from- we don‘t speak with an accent, dress a certain way, or have the usual discerning attributes locals do. We are usually a damn sight scruffier than pretty much anyone because we ride around on a bike. And then why the hell are we on a bike..? 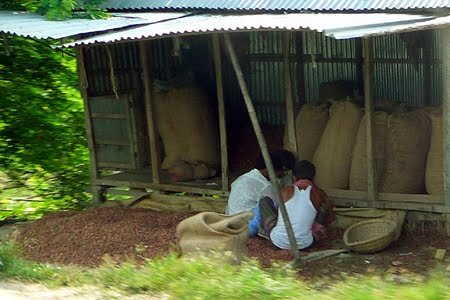 Eating is a particular joy- no one can get enough of watching the aliens eat Bangladeshi style. This morning we ate fried egg on toast. We ordered ‘fried egg‘, and then ‘toast‘, and combined the two. Shock horror. I thought the waiter was going to drop dead, he was so stunned. The concept of ‘tourism’ seems strange to some people. At 5am this morning we stopped to ask a policeman for directions. He saluted and asked if we were from the British High Commission in Dhaka. 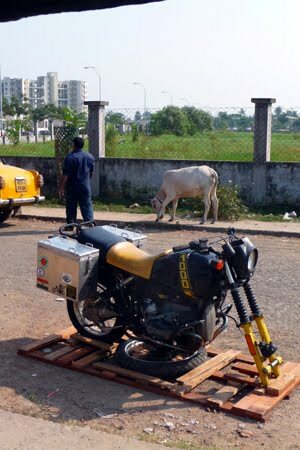 Anyway, so we were trying to ship the bike from Chittagong. 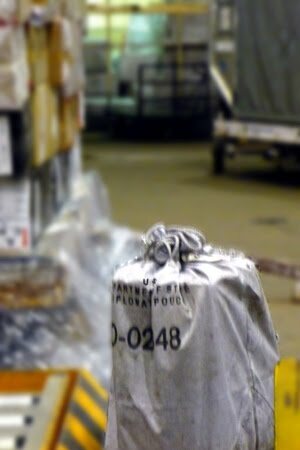 We spent a few days visiting shipping companies, and investigating prices and timetables. Then we gave up. It all looked far too much like hard work. The bike would be on a ship for a month. It would cost the same as flying. The shipping agent tried his hardest to ignore us, even while we were actually sat in his office. (He came up to us after ignoring us for half an hour to announce he was going on his lunch-break. Did we want to sit at the desk for an hour and wait?) The other one was worse. In the end we decided that despite the dreaded Road of Death, we would ride back to Calcutta to ship by air from there, thereby arriving at the same time as the bike. So there was only one thing left to do: go to the seaside!! 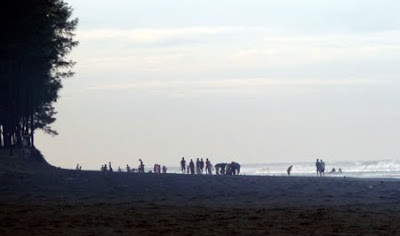 Bangladesh is very proud of Cox's Bazaar beach. It is officially the longest beach in the world. So we went to see it. It was a nice beach. Very large. We rented a tiny quad-bike and zoomed up and down on it, past gawping beach-goers. We walked around on it. I poked some starfish. 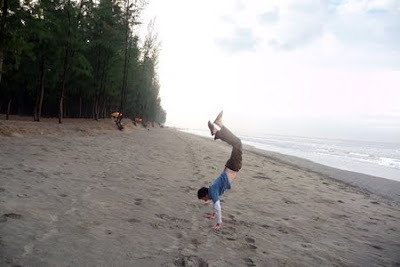 Adam practiced his handstands. 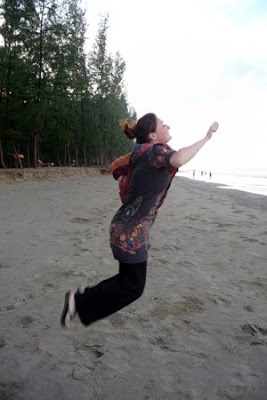 I practiced my jumping. 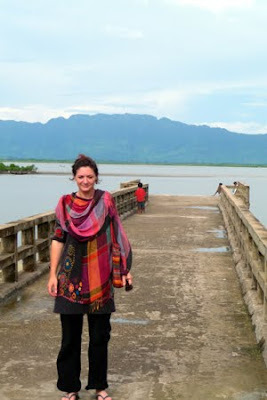 We decided as we were in the area, it would be silly not to visit the Burmese border, 3 hours south. I’d pretty much changed my mind after the not-so-fun bouncing trip down there, and the horrible arrival into a grotty little smuggler’s port, where a rickshaw man cycled us all the way to nowhere, before trying to leave us there. We were really in the middle of nowhere though, and people were stunned to see us. Kids followed us and army officials invited us into their huts. 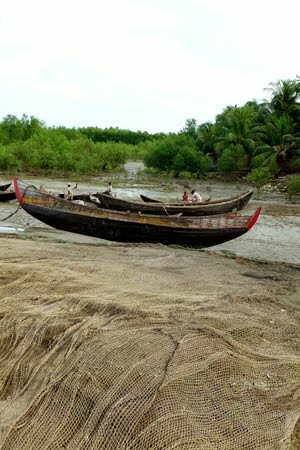 We floated round the fishing boats, debating whether they would be willing to smuggle us into Burma. We wandered down to the Burmese immigration, just to make sure they didn’t perhaps want to let us in and save us all the hassle. Funnily enough, they didn’t, so we came back. The forbidden land. 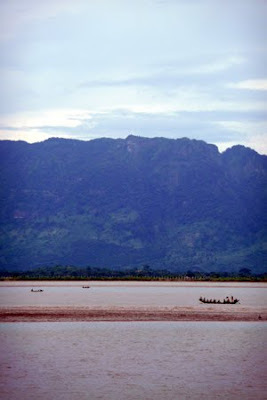 Burma and the bast'd Burmese government who don't want us. 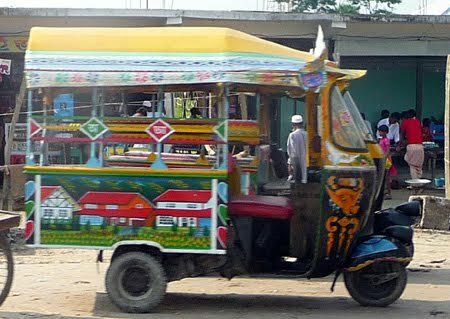 We are back in Dhaka now, after a mammoth trip starting at 4am this morning to avoid the worst the Dhaka-Chittagong highway could chuck at us. We made it without stopping, and got here 7 hours later. 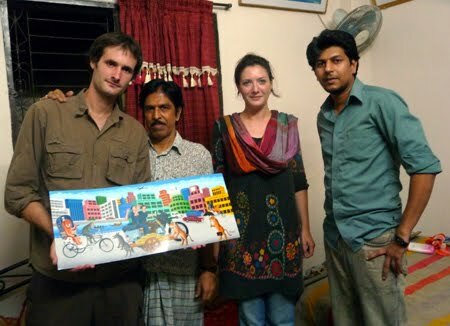 We are here to pick up our Mr Ahmed rickshaw-painting, before zooming onwards. We have just been to see him. He has done a brilliant job and made us a very surreal souvenir of our stupid road-trip. It will go on our boat (The one we plan to live on when we get home. Not our secret yacht, or anything.) and remind us of long-gone days. that's us in the middle. those are tigers, yes. Next stop: the Indian border crossing. With a slightly suspect visa form and a badly filled out carnet, we are going to be winging it. The last border took 5 hours, and that was with the right documents. Oh dear. See you on the other side.